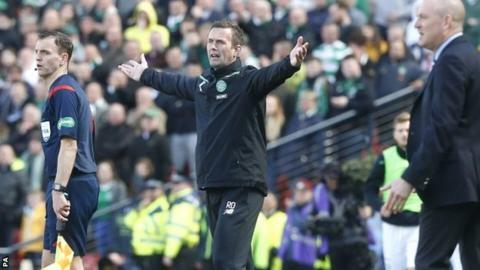 Celtic boss Ronny Deila admits he faces an uncertain future after his hopes of a league and Scottish Cup double ended with defeat by Rangers on penalties. The Hoops are eight points clear in the Premiership with five games left. But the Norwegian has been criticised for their performances and acknowledged he will come under further pressure after defeat by their Glasgow rivals. "Overall it is my responsibility. If that is not good enough, then it is not good enough," he told BBC Scotland. "I'm very disappointed of course. It was draining. You want to win football games and in the end it was not good enough. "It was a very hard game but we now have to fight for the league. We have a very good chance but there are still five games left, so we look at it after that. In football, you never know." Deila admitted his side were "too passive" in their pressing of Rangers in the first half, and goalkeeper Craig Gordon agreed their start to the game ultimately cost them. "We should have performed better in the first half," he told BBC Scotland. "If we had done that, we probably would have gone on to win the game. "I didn't think Rangers carried a great threat after half-time. I thought we were the better team once Rangers had scored their second goal, and we had chances to go on and win it." Gordon claimed referee Craig Thomson wrongly awarded Rangers a throw-in in the build-up to Barrie McKay's extra-time strike which put them 2-1 up. "The throw-in has gone the wrong way," Gordon said. "Three players are in front of the referee and he has got involved in something else. "That said, we should have defended it better but it was a one-hit wonder. He could probably have hit it another 100 times and not hit it as well." Celtic now face a testing week before resuming their quest for a fifth consecutive league title with a home game against Ross County next Sunday. "Of course the pressure is going to come on all of us now," Gordon added. "Collectively we are going to have to deal with it and everyone has to step up and take responsibility and move forward. "It is a sore result to take, especially here in a derby match and emotions are raw. The fans are going to be unhappy about it. "It is up to us to fight back. It is very difficult after a result like that but we have to do that now and go and win the league. We are professional sportsmen and that is what we have to do."